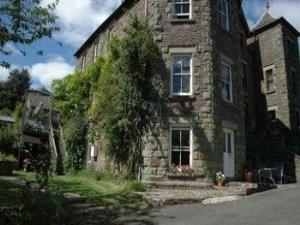 The Retreat Holiday Apartment01873 890535work Self-cateringThe Retreat, Self Catering Holiday Apartment. Tourist Board 4 Star rating. Sleeps 2. A beautiful, spacious ground floor apartment in a large 17th Century country house located near the village of Pandy to the north of Abergavenny. The Retreat sleeps 2 in 1 Bedroom. The modern wooden kitchen is complete with fridge, freezer, washing machine/dryer, dishwasher, electric oven, hob and microwave. The living area has a modern style electric fire and comfortable sofas - ONE OF WHICH IS A USEFULL SOFA-BED, Sky Freesat TV and DVD. The wet room style bathroom has a large shower area, bath, toilet and washbasin. There is a comfortable double well appointed bedroom. Bed linen and towels provided. Electricity and oil central heating included. Own water supply from a mountain spring. Pets are welcome on discussion - preferably only one. Non Smoking. Variable mobile phone coverage in the area. Green Dragon Level II Environmental Tourism Accreditation. It should be noted that the property is accessed via a shared stoned driveway and there is private parking for 2 cars.